In the previous article in this series, we walked through creating an Android app, adding a MapView to it, and displaying points of interest on it. When the user’s location changes and when the app first loads, we communicate with the PHP service, which we set up in the first article, to get all of the points of interest within a number of meters from a certain latitude and longitude. Today we’re going to look at adding new points of interest. This actually involves an interesting dance between the client application and the cloud. We’ll discuss that first. Let’s start by adding some new variables to Constants.java. 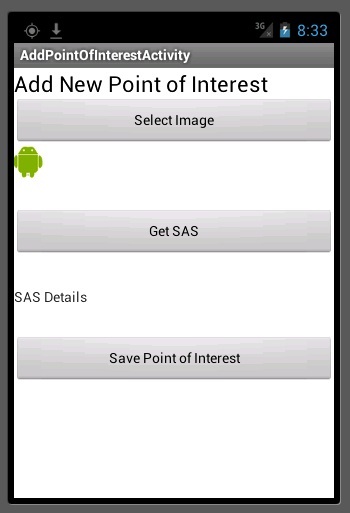 Specifically, we need URLs for getting a SAS and uploading a point of interest. We also need to keep track of a container name for blob storage. We first check the requestCode to see if it matches the value sent into startActivityForResult. We then check to see if the resultCode matches another value. This value will be returned from our new point of interest activity if we successfully added a new point. Normally we would have used a constant for these values but for ease of explanation, I’m just using numbers right in the code. Finally, if we did create a new point, we reload the points from the server. Now that the UI is done, we’ll do the code behind. We’ve got a lot going on here so we’ll go step by step. We first check to make sure the image and location are valid. We then open up the image file and get the bytes for it. We then create a HttpURLConnection and write the image bytes to the SAS URL. Provided we get back a 201 response code, we then generate a JSONObject with all of our point of interest information in it including the coordinates, ID, type (image or video), URL, and description. We then use another HttpURLConnection to post to our PHP server to let it know we generated a new point of interest. We return the response message from that to the calling method (which passes it to the postExecute method seen above). When we run the app, we’ll set our location to be in downtown Seattle, near where we were yesterday. Currently there are three points of interest. We’re going to add a fourth. Let’s follow the flow of adding a new point of interest. 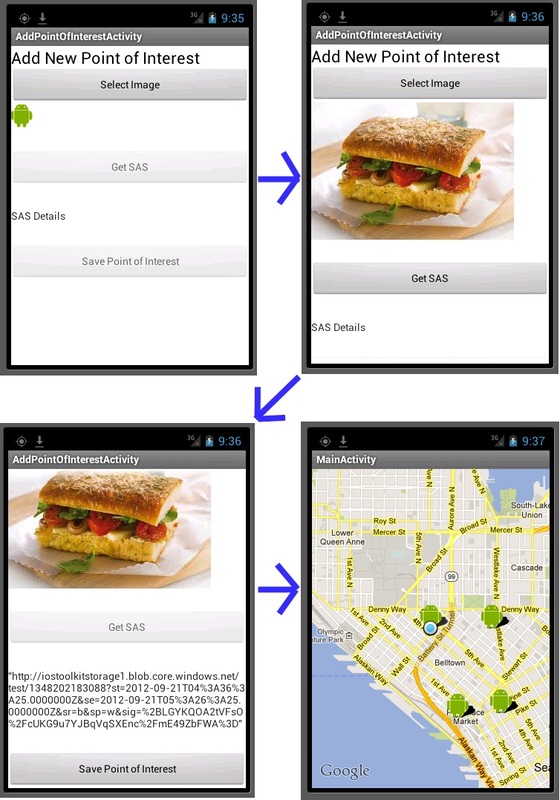 Today we finished our Android Geolocation app. 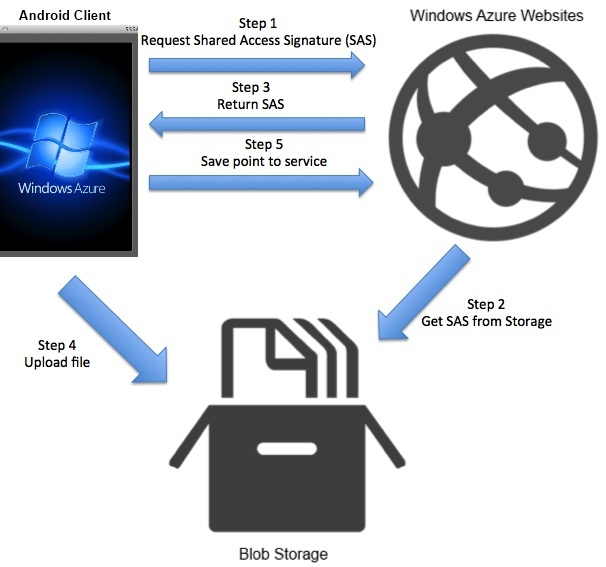 In doing so, we made more connections to our PHP service running in Windows Azure Websites in addition to using Windows Azure Blob Storage for storing images. I hope this has proved informative and has given you some solid understanding of how to create Android applications with geolocation components powered by Windows Azure. As mentioned at the top, you can access the source code for the full version of this app on GitHub. Remember to configure the subdomains in the Constants.java file before trying to run it.